This week: an efficient, flexible linear LED module, a new way to hold COB LEDs from Molex, and Apple's anticipated entry into home automation. At its Worldwide Developers Conference, Apple announced HomeKit, a platform with which it hopes to entice developers to integrate their home automation solutions. The idea is to bring uniformity to the home-automation scene by letting you control all of your Internet of Things devices from an iPhone or iPad. HomeKit is integrated with Apple's voice-recognizing assistant, Siri. But with Apple, uniformity is a sometime thing. Apple's com­mon strategy is often referred to as a "walled garden" -- any device as long as it begins with an "i." Mashable paints the picture starkly: Will you live in an Apple home, or a Google one? While Google has not yet announced such an overarching strategy for home automation, it is widely expected that it will, after the company paid $3.2 billion for Nest, maker of smart and connected thermostats and fire alarms. Among the companies pledging to support HomeKit during the WWDC announcement were August (the company behind the much-buzzed-about and soon-to-be-released Smart Lock), Cree, Haier, Honeywell, iHome, Netatmo, Osram Sylvania, and Philips. Some of these, such as Cree, have no announced products in the area of home automation. HomeKit will appear in iOS 8, due for release in September but available to developers now. iOS 8 also includes HealtKkit, a similar framework for unifying data from fitness devices, healthcare providers, and medical history and diet apps. NTDV Gadgets suggests that HealthKit "may test just how much Apple customers trust the... company to maintain their privacy." Osram Sylvania announced the PrevaLED Flex Linear light engine at Lightfair. It is based on a flexible printed circuit board, which can be bent to a 3-inch radius and cut at multiple points, and claims a lifetime (L70) of 60,000 hours. Accompanying the announcement, Osram has published technical details of the design on the SPIE site (PDF here). The design utilizes a PCB consisting of copper sandwiched between layers of a specially formulated polyethylene terephthalate (PET) that has 90% optical reflectivity. Mid-power LEDs in surface-mount packaging are soldered to the copper at intervals. No other heat sink is required. 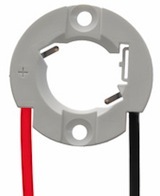 Sylvania claims an efficacy of up to 173 lm/W for the flexible light engine, in part because they have solved the problem of employing an efficient constant-current driver on an LED string of unknown length. The company calls its MX2258 a second-generation COB LED holder. Its thickness is limited by its connecting wires, allowing the secure placement of chip-on-board LED arrays in close proximity to secondary optics. This results in tighter beam control and higher luminous efficacy, according to the company. The holder body is white and highly reflective. The wires are pre-attached for structural strength.